When it comes to the Lexus LFA, there's plenty to be excited about. There is the 552 horsepower V10 with a 9,500 rpm redline, the carbon fiber monocoque, the fantastic performance stats... we could go on, but we'd rather let the Brits take over. Hit the jump to witness the first Lexus LFA delivered to our island ally. The greatest-ever Lexus made an appearance at the Supercar Sunday Breakfast Club at the Goodwood Motor Circuit, and it promptly led to a bit of drooling and gushing. The hot-to-trot LFA seduced the crowds with it's luxury and gadgetry, but it won our hearts when we heard the Formula One-like engine as it roared to life. 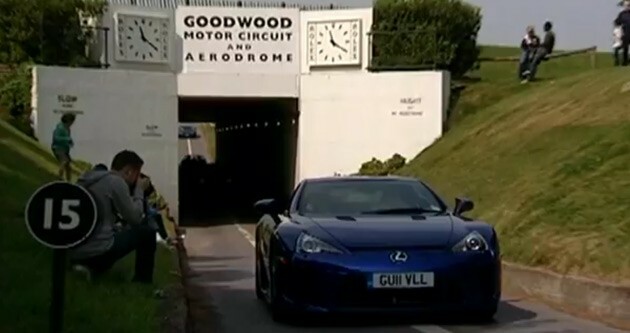 First Lexus LFA delivered to UK originally appeared on Autoblog on Thu, 05 May 2011 16:59:00 EST. Please see our terms for use of feeds.